First you need to search for “MailKitchen” in the plugin search bar (click on Plugins -> Add new). Once you’ve found it click on Install now. Once the download is complete, go into your WordPress Administration dashboard and in the menu click on Plugins -> Installed plugins. You will see the plugin in your list . To install the plugin click on Activate. A MailKitchen menu will then appear inside the menu of your Worpress dashboard – this means that you successfully installed the plug-in. Download the file mailkitchen.zip . You should see a folder with 6 MailKitchen files and a php file (if you see another MailKitchen file, do not panic, it is because you made a bad extract, you only need to move it in the plug-in file and delete the remaining empty folder). Warning: do not rename the “MailKitchen” folder, otherwise the plugin will not work! Once the file uploaded on your server, log into your WordPress account and on the dashboard click on Extensions -> Extension installed in the main menu. The plugin will appear n the extensions list and you need to click on Activate. A MailKitchen menu will appear in the menu of your WordPress dashboard, which means that the plug-in has been successfully installed. Before being able to create a sign-up form on your WordPress website, make sure that you have completed your registration and that you’ve created a Mailing list on your MailKitchen account. To access the login page from your WordPress dashboard click on MailKitchen or My MailKitchen account (the tab is now visible on your WordPress menu). 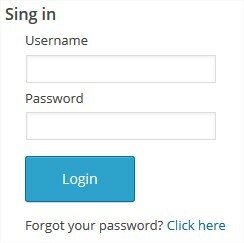 Enter your username and password in and click on LOGIN. The plug-in will then be connected to your MailKitchen account and your actions will be recorded on the platform. You can always delete your ID from your WordPress dashboard. However, note that in this case your newly registered subscribers won’t be saved on your MailKitchen account. How to import your contacts from a .Csv file?